Grandville has a strong tradition of placing at State since the early 90's. Since 2002 they have also had their trip to state captured on video. Grandville's year end cheer banquet is coming up this April. At the end of the cheer banquet, the team and parents gather around the years State Competition video to relive the the excitement of the competition. Thank you for allowing me to produce your video year after year, it has been great to be a part of such a special day. Until this years banquet, here is a sneak peek of this years video. Go Dawgs! Hartland's year end cheer banquet is this Thursday where along with recognizing their many accomplishments they will be viewing their State Competition Cheer video that we produced for them. Since it is under wraps until Thursday here is a sneak peek. Amanda & I had the opportunity to go behind the scenes and film both Grandville and Hartland Cheer teams in their preparation for State, the competition, and through the emotions and excitement of the award ceremony. Throughout the years of filming Competitive Cheer competitions I have been amazed at the amount of work and athleticism that is required for this sport. Watching any of the previous videos, this is obvious. The editing has begun and we are excited to create another exciting video for both teams. Until the editing is complete, below are a few stills from the video. 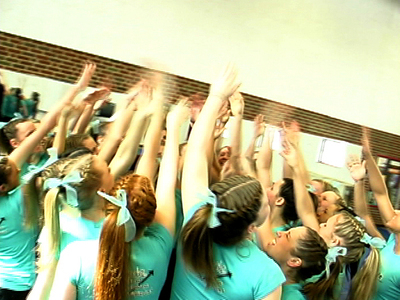 Stay tuned for the release of the 2007 State Competitive Cheer Competition video. We are very excited about our new website that we are developing. It is a fresh new look that reflects our style. It should be going live at http://www.capturedproductions.com soon.